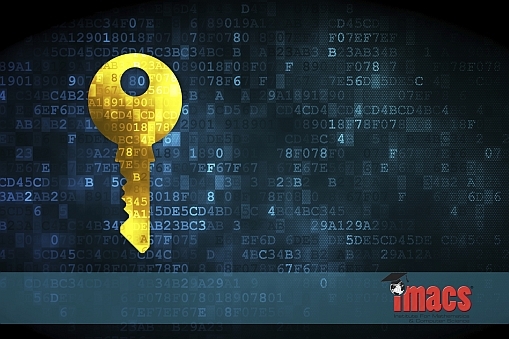 EMF teaches modern algebra, which has important applications in public-key cryptography. The Institute for Mathematics and Computer Science (IMACS) recently released its first online algebra course, Algebra: Groups, Rings and Fields. This is the tenth course in the Elements of Mathematics: Foundations (EMF) program for talented secondary school students. Our latest self-paced offering has generated a fair amount of inquiries from parents seeking options for their mathematically advanced child. The answers to some of those questions can be found in the FAQ at elementsofmathematics.com. IMACS responds to others, which have been consolidated by topic, in this week’s blog post. Q: My child aced pre-algebra and is ready for algebra. Why can’t I just enroll her in the first EMF algebra course? When people use the term "algebra," they’re usually talking about high school algebra or what mathematicians call "elementary algebra." By contrast, EMF teaches the kind of algebra that a mathematics major at university learns called "abstract algebra." A student who has mastered pre-algebra is, no doubt, ready for high school algebra. However, this same student, no matter how talented, is simply not ready to jump directly into abstract algebra. Why? Just as success in high school algebra is built on the foundation laid by elementary school math up through pre-algebra, success in abstract algebra requires a strong foundation in various mathematical structures and reasoning techniques that are rarely taught outside of a university setting. This important foundation is built up through the first nine courses of the EMF program. In fact, one might think of these early courses as constituting "pre-abstract algebra." As such, they are an integral part of the EMF program and essential to success in the later courses. In case you’re wondering, students who complete the EMF algebra courses will have learned all of elementary algebra and be able to solve any high school algebra problem with ease. But they will also have learned a great deal more and be well-prepared to study the high-level mathematics that is at the heart of important disciplines such as particle physics and cryptography. Q: What if my child already took high school algebra and geometry? Is there anything left for him to learn in EMF? As IMACS principal founder and EMF co-author, Burt Kaufman, once wrote, "It is surely a sad state of affairs that in the traditional high school curricula, the student encounters very few, if any, mathematical ideas that postdate the seventeenth century. … It would be ludicrous if an English curriculum for the high school never contemplated confronting the student with a piece of literature written after Shakespeare. "* That’s one key reason why the EMF curriculum was created—to teach modern mathematics to talented, young students who are capable of benefiting from advanced material that goes beyond the outdated math curricula used in schools. Naturally, more experienced students will find some of the EMF material familiar, but EMF approaches these topics from a far more sophisticated standpoint. Between the new mathematical structures and techniques for reasoned argument that they will be learning, there is much for these students to gain in EMF if they are motivated to learn real mathematics as opposed to just school math. Q: We tried other math programs for advanced kids, but they just seemed to be about going faster or preparing for competitions. That’s not working for our son who’s more of a deep thinker. I’ve heard that EMF takes a different approach. Can you explain? "‘I wasn’t the fastest guy in the world,’ Dr. Simons said of his youthful math enthusiasms. ‘I wouldn’t have done well in an Olympiad or a math contest. But I like to ponder. And pondering things, just sort of thinking about it and thinking about it, turns out to be a pretty good approach.’"
"I work with a lot of mathematicians, and one thing I notice about them is that they are not particularly fast with numbers; in fact some of them are rather slow. This is not a bad thing; they are slow because they think deeply and carefully about mathematics." The competition-inspired approach to math has its merits. But it’s hardly the only approach worthy of mathematically talented kids. The gifted population is filled with individuals who have exceptional talent and prefer to take their time. EMF is an ideal option for these students because the program is self-paced and encourages patience in coming to a deeper understanding of complex and beautiful ideas. At the same time, we’ve had numerous EMF students who also enjoy and excel at competition math. In fact, in situations where speed is of the essence, the non-standard mathematics to which EMF students are exposed gives them a distinct advantage over others who are seeing these ideas for the first time during a competition. Image: CERN. Shared under CC-BY-SA 3.0 license. 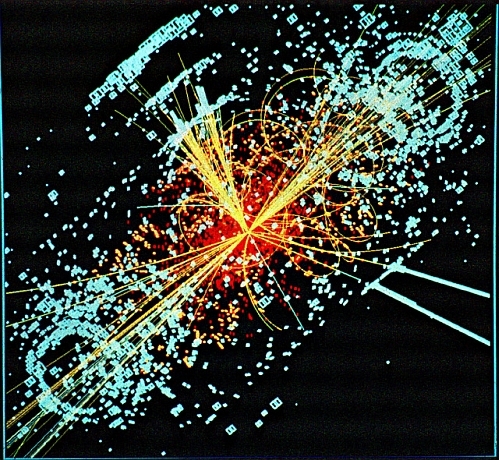 EMF algebra students will have a head start in the mathematics of particle physics. Q: You say that EMF is "mathematician math," and that it’s taught the way a math major at university would be taught. That’s nice, but what are the benefits for a talented child who has no interest in being a math major, let alone a mathematician? "For sure, or almost for sure, if you’ve come out of the high school you haven’t got a clue what mathematics is. Which is why when students come out of the high school and get to university to major in mathematics, they have one really disturbing first semester or first term because they discover it’s not at all what they liked. It’s some time during that period when many high school math whizzes drop out and do computer science or engineering or something else, and the occasional arts major or classicist major intended suddenly gets turned on to mathematics when they discover it’s a creative discipline that allows their creativity to really come out in different ways, and it’s challenging intellectually, and then they get turned on to mathematics." Whether your child decides to pursue a math major or not, there are several important skills that the EMF approach to mathematics teaches. As with all IMACS programs, EMF fosters the development of logical reasoning skills in young students. While some people believe that logic is cold and inhibits creativity (think: Star Trek’s Spock! ), our experience teaching the EMF curriculum over the past 30+ years suggests otherwise. To the contrary, we have found that when IMACS students are equipped with the logic skills to construct their own well-reasoned arguments and critique those of others, the clarity of thought that this produces unleashes creative and innovative ideas that were previously unfocused or muddled. Which brings us to how EMF encourages creative thinking. As Professor Devlin reminds us, mathematics is a creative discipline. The fact that what passes as "math" in schools is devoid of creativity should not be taken as evidence that true mathematics is indifferent to creative thinking. School math tends to take a "tell-then-drill" approach where the teacher states a rule and then students apply the rule to umpteen haphazard problem sets. By contrast, EMF uses carefully constructed exercises and interactive technology to guide students to their own "discovery" of mathematical results. To be successful in EMF, a student simply must think creatively in order to cross the bridge from keen mathematical observations to the "A-ha!" moments of intuitive understanding. And when these moments happen, the joy and pride of having climbed the intellectual mountain are profound. Another skill that EMF promotes is abstract thinking. Imagine a world in which most jobs involve people interacting with tangible objects in the present. Perhaps you envisioned the Industrial Revolution, a time when mechanical inventions led to an explosion in manufacturing. Today, we find ourselves amidst a Knowledge Revolution wherein technological inventions mean that well-paying jobs require abstract thinking about intangible ideas such as code. This is obviously true in tech, but because tech touches every industry now, it’s also true for wide-ranging fields from medicine to music to law to film. It’s the question on many people’s minds: Are you going to design and program the robot, or will you be replaced by the robot? Whatever career your child pursues, he or she will almost certainly need to think abstractly. Abstract thinking is fundamental to the study of genuine mathematics, which is what EMF teaches. Is EMF right for your child? IMACS created a 30-minute, online Aptitude Test to help prospective parents and students answer this question. Register to take the FREE test at elementsofmathematics.com. Extensive sample content from actual EMF courses is also available at elementsofmathematics.com. * Kaufman, Burt, Jack Fitzgerald, and Jim Harpel. MEGSSS in Action. St. Louis: CEMREL, Inc., 1981.